Beauty Comes Some Serious Elbow Grease. I'm Just Sayin'. Also Made Time To Play In The Studio Some. 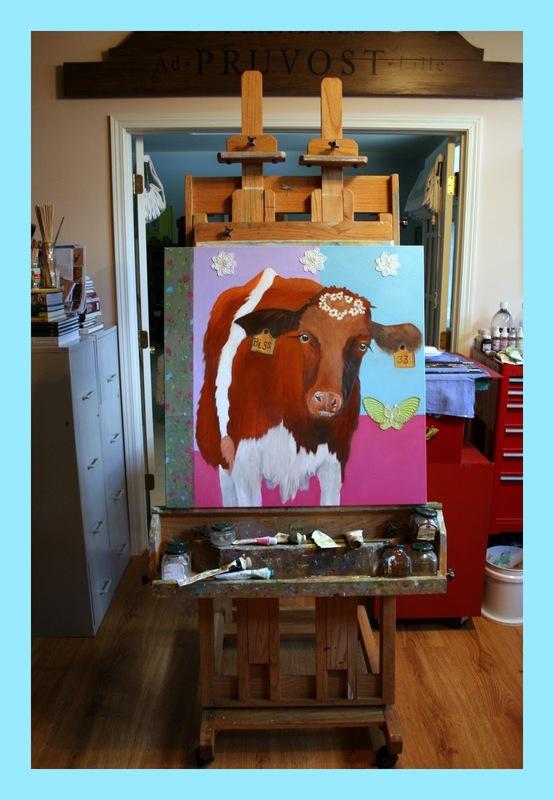 Working On A Cute 30X30 Sweet-Faced Cow. She's A Work In Progress But Thought I'd Give Y'all A Peek. Why A Cow??? When I Asked My Mama What She Wanted For "Mother's Day"..She Replied, "A COW." Now Don't Ask Me Why She Wanted One..I Sincerely Don't Have A Clue! A cow sounds so random, but for some reason it makes sense to me. Why not a cow.....I love it and so will she. Terri, my friend, you are the sweetest daughter to make that gorgeous cow for your Mama - I love it! She is one lucky lady!! Beautiful cow! Yes, when the weather is nice, it's a shame to stay indoors! Darling! What a happy gal with her flower crown and cheery colors. I'm sure your mom will love her. Adorable. I love cows. Especially this one! It looks so sweet. Your Mum is very lucky! Darling Terri, sooooooo cute and sweet cow!!! I'm sure your Mom will love it.